PSX eBoot Creator was made by Impaler to simplify building of PSX eBoots from Playstation 1 games / PSX isos. 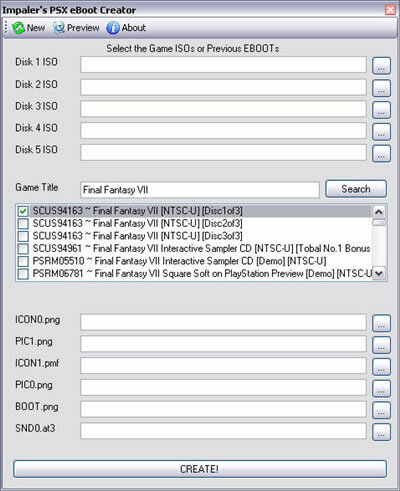 PSX eBoot Creator lets the users create a single or multi-disk PSXpsp eBoot, based on how many PS1 disks / isos are selected. At this time only ISO disk format is supported but there are many disk converters for download to convert BIN/IMG files to ISO. Another great feature of the PSX eBoot Creator is that it also allows users to select an eBoot and convert it to an ISO so that user can play it on a PC Playstation 1 emulator or burn to a CD. selection screen lets the user to select an PSX ISO or PS1 eBoot. If an eBoot is selected, the user will be asked for a new name and the eBoot will be converted back into an ISO file. user must enter a Game Title - this will be used as the name of the folder that is created for the eboot. After entering the Title click search and a list of matches will appear. ONLY SELECT ONE code. If more than one title is selected an error is shown. ser can select a different images (png) for the menu. The best website that i have found is PopStation ImagePacks. After the images are downloaded, just select them.